Once upon a time in a far away land (Sandersville, Georgia 1945 to be exact), there was born a Doris Curry. Little did anyone know at the time that this child would grow to be Doris Duke and have a major influence on what we call deep soul singing and one of the best selling cheating songs of all time. That song, "To The Other Woman (I'm The Other Woman)," continues with "and the other woman is his wife." All this started on a small label, Canyon Records, in collaboration with singer/songwriter Jerry Williams Jr. aka Swamp Dogg. 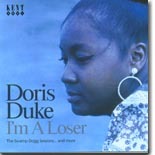 Unfortunately, the label lasted for only 18 months but not before it spawned soul music's first true concept album, titled I'm a Loser, and the mega hit mentioned above. To briefly quote this release's liner notes; When I'm A Loser was released as Canyon LP 7704 in the closing weeks of 1969, there was plenty to be optimistic about. Soul fans the world over immediately hailed it a masterpiece. In the U.K., Blues & Soul magazine championed it repeatedly with almost overwhelming zeal. Editor John Abbey took a whole page in the magazine to give the album the kind of song by song critique that the rock press usually lavished on the latest works of the Beatles and the Rolling Stones. A few issues earlier Dave Godin proclaimed it to be the best album he had ever heard. There can't be too many deep soul fans out there who do not agree with everything they both said. After Canyon folded, Doris recorded another album in collaboration with Swamp Dogg, A Legend In Her Own Time. It was among the first releases on a new label that the well-known independent Excello Records had created expressly for the purpose of putting out material from Jerry Williams Jr. Sadly, by including only a few new songs, and electing to cover recent pop and R&B hits, this second LP failed miserably. The incredible Doris Duke voice is there, but the fan support was not. Shortly thereafter, Duke parted ways with both Williams and Excello and her career ended in disillusionment and disappointment. What we have on this new release are both of these albums in addition to a few early single tracks. This is an important reissue and one that should be in very collection of important soul music. It is certainly one of the year's finest efforts to date.